A quick update for those of you that don’t follow my Facebook page or Tumblr: early last month I loaded up Callie and hit the road for Manila, something I’d been wanting to do for a while now. I’d actually been wanting to do a full Philippine Loop, including Mindanao, but for now I was happy tackling the Visayas and part of Luzon. I’ll just consider it more a scouting mission so that when I finally take that longer road trip, I know where to spend more time and where to avoid. I spent five days on the road riding up to Manila and five days on the road down (with a three-week layover in-between). It was at different times inspiring and humbling and relaxing and frustrating and fun and depressing and everything in-between. And it was a great test run for next month’s four-week tour through Vietnam. And while it’s impossible to fairly distill ten days of riding into a single blog post, here’s a quick recap of some of my favorite (and not-so-favorite) bits. Leyte and Samar were the first stop on the road north after leaving Cebu, and while Leyte was nice enough, Samar was absolutely stunning from the moment I crossed the San Juanico bridge that linked the two islands, to the moment I hopped on the ferry to Luzon. Green and clean and just chock-full of long, curvy roads, it was an incredible joy to ride. I accidentally left my helmet cam running while on the ferry ride over from Samar, and the battery ran down before I got to Luzon—it was the greatest tragedy of my ride up. Southeastern Luzon’s Bicol region was so much more beautiful than I had expected, starting as soon as you get off the ferry in Matnog and appearing almost non-stop through the Mayon-dominated landscape and well into the amazing Tiwi coastline roads. 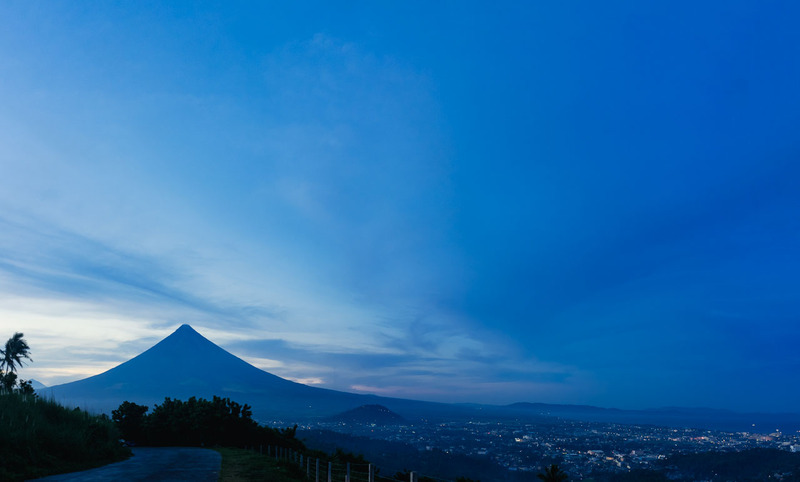 Bicol might easily be one of my favorite areas of Luzon. One of the other great tragedies of the ride was that it rained for most of my ride across Negros, making it hard to get many shots of its gorgeous countryside. The ride across the mountain range was particularly beautiful, with incredible views almost every step of the way. Sadly between the inclement weather and the lateness of the ride (I spent much of the time in darkness), I don’t have many records of the magnificent sights the ride offered. But no problem—it’s the perfect excuse to do it again. Filipinos are notoriously assholey drivers, and that assholery increases tenfold when you take them out of the city, where there are no traffic jams to slow them down or cops to deter them. 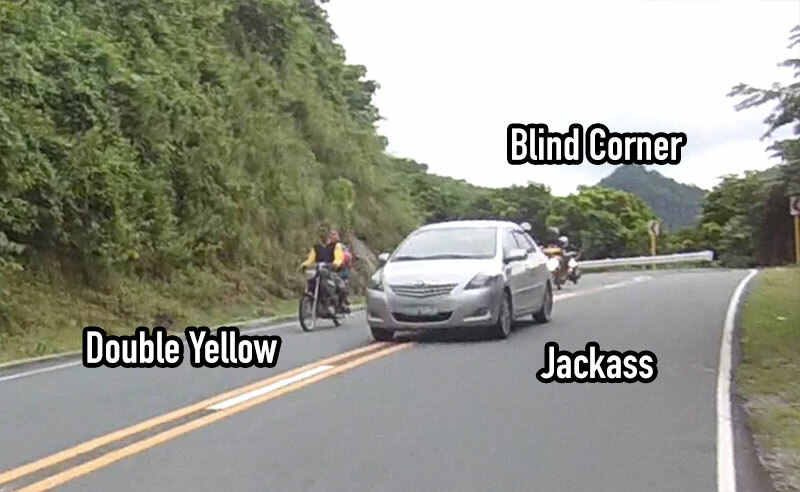 Driving in the provinces is a combination of the Law of the Jungle and the Laws of Physics; drivers will bully each other based on the sizes of their vehicles, and as such motorcycles are at the bottom of the food chain. I was run off the road on a daily basis by oncoming assholes barreling down my lane as they tried to overtake long lines of cars. Even though it was plain as day they wouldn’t be able to clear the line, they’d remain in my lane, knowing I’d have no choice but to pull off the road or wind up someone’s hood ornament. 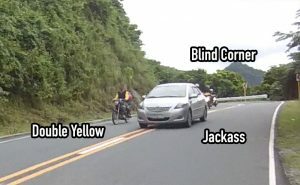 I sadly don’t have any photographs of them in action, but this video screencap of a dipshit overtaking a long line of motorcyclists around a blind corner (a very common occurrence) should illustrate the issue clearly. Here’s a video (not mine; strong content) of what happens all too often when these shitheels act like traffic rules don’t apply to them. Whatever weather luck I had going up abandoned me for the trip back, because more than half my time was spent riding in heavy rain (the rain goes for hours over here, so waiting it out wasn’t an option). And since you get wetter the faster you move in the rain, even a light drizzle was enough to drench you at a 40–50kph clip. Imagine what the downpours did. Worst of all, the rain meant that I couldn’t take any photos or videos for most of the ride back (my helmet cam may be waterproof, but that doesn’t help much if there are massive drops of water on the lens, obscuring the video). I was able to shoot during the dry bits, but even then I was wary of keeping my camera out too long. On top of all of this, the rain-slicked roads meant that I had to take turns at slow, safe speeds. There are few things as disappointing as having to take a beautiful curvy road at 15kph because you don’t wanna go off a cliff. It may be called “The Queen City of Bicol,” but I call it “The Ugliest City I’ve Ever Seen.” Maybe it was because I arrived on a Friday afternoon, or because I stayed in the city center, but from the moment I pulled into town until the moment I left, all I found in Naga was grime, mad chaotic traffic, overcrowded litter-covered streets, and scowling faces (I had never seen as many grumpy people as I did in Naga). I’ve never before visited a place that I couldn’t find something intriguing, fun, or picturesque about, but I drew a completely blank with Naga. I couldn’t even find a single thing I cared to take a picture of. If it has any redeeming qualities I couldn’t find them and I have no desire to go back for a second look. Even with all the setbacks and less-than-fun bits (full disclosure: the “Bad” section should be a lot longer but I didn’t want to sound like I was grousing too much), the ride was still absolutely worth every minute and full of numerous small, wonderful moments that didn’t make the list: the gorgeous zigzag road up Mayon volcano, stopping along the Tiwi coastal road to take it all in, spicy mango shakes in Bicol, and so much more. My only real regret is not having more time to explore and check out the various little gems I had to pass along the way. I also would’ve liked to have camped more, but failed to due to poor planning on the way up and poor weather on the way back. But on the bright side it gives me something to look forward to for the next one.